It is often said that it’s the journey that matters, not the destination. But I believe it matters which direction you’re going on the journey of life since I see it as a constant process of evolution and transformation. Everyone has a voice inside that’s guiding them toward their greatest good and to highest version of themselves. I’m here to help people hear that voice. I was fortunate to hear the call of my own inner voice early in life, as I connected even as a small child to the spirit world. As a young adult of eighteen years of age, I began my spiritual practice in earnest in my native Brazil under the guidance of Luiz Gasparetto, the well-respected psychologist, metaphysical teacher and spiritual psychic artist. For fourteen years, I studied in his spiritual and metaphysical center in Brazil. There, I developed my natural ability to channel and began my work as a spiritual counsellor, using the direct guidance I had received through channeling to help people grow and understand themselves. In 1989, I founded Spirits of the Earth®, a spiritual adventure travel company that guides people on spiritual journeys to Machu Picchu, Peru. These excursions have touched the lives of thousands of individuals who have experienced the awakening and healing attributes of this sacred place. During these travels, I have been initiated as a shaman in the Inca Tradition many times by different elders in Peru, including the Q’eros. 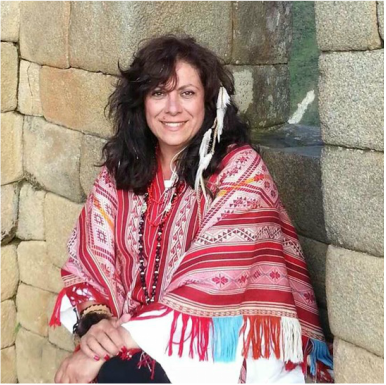 In addition to spiritual adventure travel, I have led a wide variety of international classes and retreats on topics such as shamanism, metaphysics, and traditional Japanese Reiki. I have guided individuals through powerful, ancient rites of passage based on Peruvian shamanic traditions, and I also lead a course called “Awakening the Illuminated Heart” based on Drunvalo Melchizedek’s School of Remembering. A workshop entitled “Navigating Your House of Mirrors” helps people unearth hidden and repressed parts of themselves. I am also an Integrative and Spiritual Divorce Coaching Professional, having studied with Debbie Ford and graduated from the Ford Institute.